Small Coppers everywhere at Adanac Park!. Over the past week while out walking at lunchtimes from the Ordnance Survey, I have noticed more Small Coppers than usual. They have always been here but not in large numbers. Today I set out with David, with camera in hand, to see just how many there are. If you go to the end of Adanac Drive where it stops at a gate. You will find a footpath that goes all the way through to Nursling Street at the other end. If you walk along this path staying mostly at the Ordnance Survey end, you will see many clumps of Common Fleabane on both sides of the path. These seem irresistible to Small Coppers! There is also Ragwort, Thistle and lots of Sorrel along here. Perfect habitat for these lovely little butterflies. I have been chasing butterflies with a camera for years and I have never seen this many in one place before. We got there just gone 10am and stayed until 11.30am. All together we saw at least 15, probably more, Small Coppers. It was by far the most common butterfly we saw! 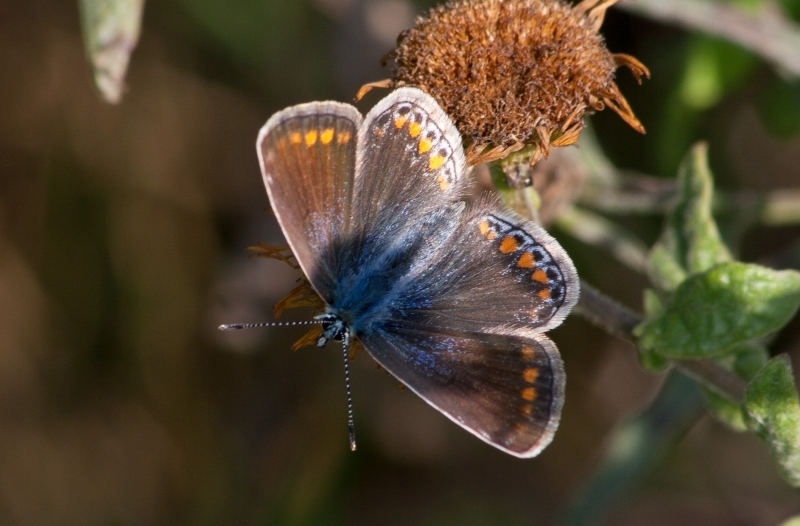 There were also about 4 Brown Argus, 3 Common Blue, 1 male, 6 Small Whites and a Speckled Wood. Potential I.D for Roger Clark's escaped/released butterfly on 22/08/18. I'd look at a picture of a female Hypolimnas bolina , Eggfly butterfly ,Roger. Not sure what other similar species are out there, H.bolina is from Asia! Large unidentified butterflies in Emsworth. I saw a couple of large black butterflies while walking in Emsworth on Sunday. It was beside a Brook. They were more interested in elderberries than in me. Can you tell me what type they are and where they might have come from please? Old Winchester Hill. Today I visited Old Winchester Hill arriving at 11:30am. The weather was sunny reaching 23 degrees. I spent 2 hours walking to the hill fort and returning through the woods and along the valley to the bottom of the car park slope. I saw a total of 13 species including my target the Adonis Blue. A total of 8 fresh males and 3 females were flying in various areas along the valley and at the bottom of the car park slope, but none were seen on the slope itself. I managed to see just a single Silver-spotted Skipper which was recorded on the far West facing slope of the hill fort. Elsewhere Meadow Browns, Small Heaths and Common Blues were the most frequently seen species, with a mating pair of the latter noted. Single Brown Argus, Chalk Hill Blue, Small Copper and a faded Small Skipper were recorded. Noar Hill. Following two previous visits and encouraged by recent reports of sightings of the Brown Hairstreak, I paid a visit today to Noar Hill. The temperature reached 23 degrees with sunny spells with some cloud. Arriving around 10am I covered most of the main paths with Common Blues, Whites, Meadow Browns and Small Heaths being the most common species. I also recorded two Brown Argus and a single battered Silver-washed Fritillary, but no Brown Hairstreaks despite looking in suitable places. 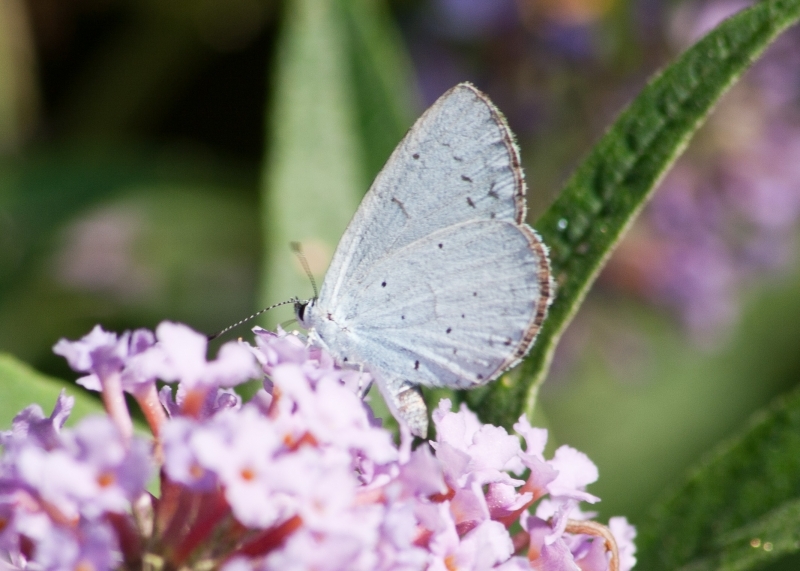 After a few hours, I met two friends who were also on the "Hairstreak Hunt". Searching once more, we finally spotted a female at 1pm towards Charity Farm in the same area as Alan Thornbury's sightings which was feeding on hemp agrimony blooms. A little further along in the same area at 1.30pm a male Brown Hairstreak descended from a tree top and alighted briefly on a blackthorn bush. Portsdown Hill and Fort Widley. Visited the East end of Portsdown Hill (SU657063) today where the temperature was 20 degrees. Several Whites were flying with a few battered Meadow Browns and Common Blues. Totals: Large White 6, Small White 11, Common Blue 6M 1F, Meadow Brown 5, Speckled Wood 1. Beacon Hill impromptu Field Trip. Today was to get some idea of how the Silver-spotted Skipper was faring at Beacon Hill. Unfortunately in that task I was sadly let down by this species. Either the species isn't out yet, or they still haven't got a foot hold here again. There are some good areas of short turf where they certainly could breed, and large scrapes, where the top soil has been taken off to reveal the chalk underneath. One of my Field Trippers did espy one but unfortunately it was so fast and furious flying through the area. I shall be re-visiting the site again next week and look at a totally new area facing south-east where the sward looks really short. However despite this today I managed to count the highest of the Brown Argus, which were everywhere, Common Blue really lived up to its name as well and the Small Heath was very common. It was good to see the Dark-green Fritillary still hanging on as well. The best was the two Robber Flies mating. I first saw them on some cattle dung but they moved onto a bush just right for a quick picture, but what fascinating creatures! Old Winchester Hill. We had a walk around Old Winchester Hill today from 1030 to 1400 and recorded 14 species the highlights were as follows. Chalk Hill Blue 1000+, Silver-spotted Skipper 50+, Brown Argus 4, Brimstone 1m, Gatekeeper 1, Red Admiral 5, Painted Lady 1, Clouded Yellow 4, Humming-bird Hawk-moth 4 and 3 Red Kites foraging over a field nearby. Ackender/Bushy Lease Wood (Alton) August 2018. On another very hot day, I spent the afternoon in Ackender Wood, Alton. A total of 6 Silver-washed Fritillaries were on the wing, most showing significant wear. As evidence of the early end to the season, there were no Ringlets or Skippers and very few (3) Meadow Browns. Colour was provided by 3 Holly Blues. One Southern Hawker was patrolling a ride, while a loose group of six were in a sheltered corner of a field. Alton - dwarf Common Blues and Clouded Yellow. A walk around the south of Alton on 3 August started on a small patch of chalk download flowers in my Alton garden, where my wife spotted a very small butterfly. 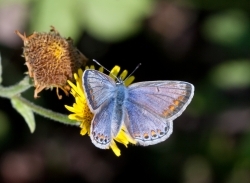 It was the size of a Small Blue - however closer inspection revealed it to be a tiny Common Blue. We then found a second, and a male Common Blue was also present. Along the Caker Stream in Omega Park industrial estate in Alton, we found another particularly small butterfly - this time a Green-veined White. The same site held 6 male and 3 female Common Blues, and a single Meadow Brown. Very few Meadow Browns were seen all day - clearly they have finished early this year. Also present here were 3 Common Darter and 3 Ruddy Darter. A Clouded Yellow was in an adjacent weedy field (SU728392). Portsdown Hill and Fort Widley. Today I visited the East end of Portsdown Hill (SU657063) and Fort Widley (SU657066). The temperature was 21 degrees. On the track along the ridge above Queen Alexandra Hospital many Small Whites were seen with Meadow Browns and a few Speckled Woods. A single Small Blue and a male Chalk Hill Blue were seen, but a surprise was an active Clouded Yellow fly past. Totals: Small White 19, Clouded Yellow 1, Chalk Hill Blue 1m, Common Blue 4M, Small Blue 1, Meadow Brown 10, Speckled Wood 4.